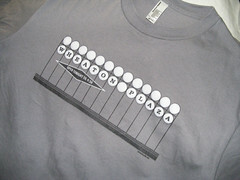 UPDATE: The Wheaton Plaza T-shirt is done and for sale! Check it out on the JUTP online store. If you buy one, send me a photo at justupthepike at gmail dot com and you might see it on the blog! 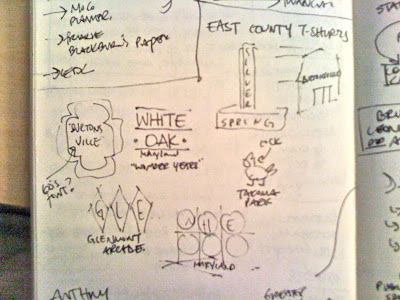 Lately, I've been messing around with the idea of designing T-shirts with for various East County communities. I always liked the local-themed line of shirts Snoburbia sold, and I was sad when founder Lydia Sullivan decided to shut down her online store to focus on being a civic activist. But while many of Snoburbia's shirts simply bore the name of a place, I wanted to take it a step further and include local landmarks. For instance, a Silver Spring shirt could play off of the Silver Theatre marquee, while a Burtonsville shirt could use the Bedding Barn, and a White Oak shirt could play off the Wonder Years logo, since one of its creators grew up there. 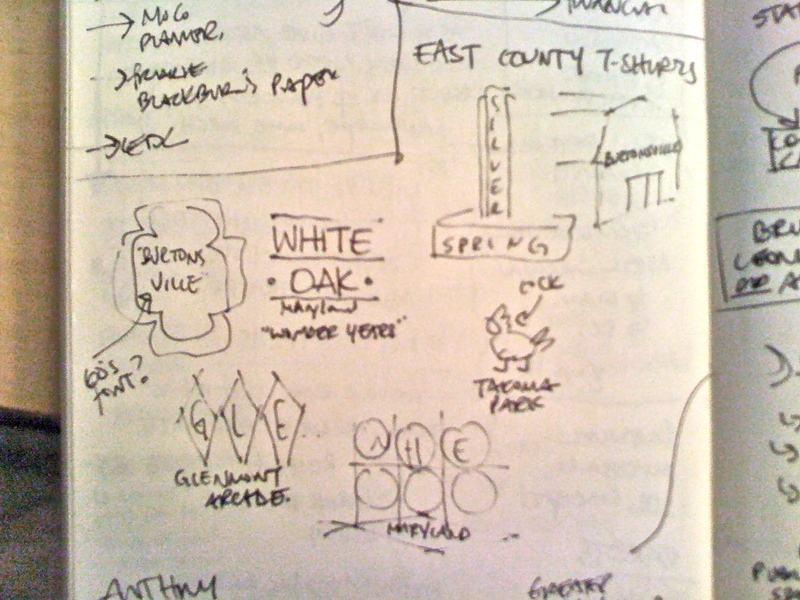 Thinking of a landmark for Wheaton was harder. There's a lot I like about Wheaton, notably all that scary ethnic food, but nothing I could think of that looked good on a T-shirt. Then I found this old photo of the entrance sign at Wheaton Plaza on this Facebook page commemorating the history of Montgomery County's first shopping mall, which opened in 1959. While current owner Westfield ignores the mall's past, the 700 or so members of this page (most of whom, it seems, grew up in the area during the 1960's and 70's) keep it alive with old photos and stories. This sign is way before my time, but I like it. The geometric shapes and clean lines are a great example of Googie architecture and reflect the idealism and fascination with the future that many Americans had in the years following World War II. It's also way more distinctive than the current entrance sign. So I created a mockup of the sign in Illustrator. I wanted to be as faithful as possible, even trying to match the original typeface (I used Clarendon). 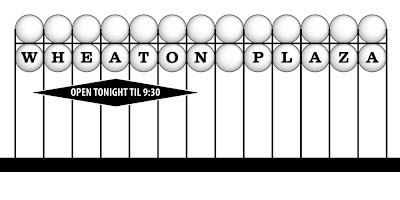 Wheaton's been suffering from an identity crisis as of late, and I hope that new and established residents alike might get something out of a design that celebrates the [recent] history of their community. And if it's received well, I'd be willing to do T-shirts for other places in East County as well. What do you think? 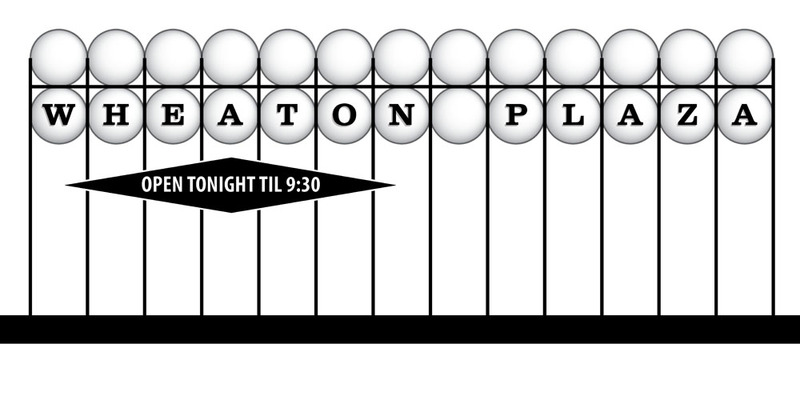 Would you buy a "Wheaton Plaza" T-shirt? 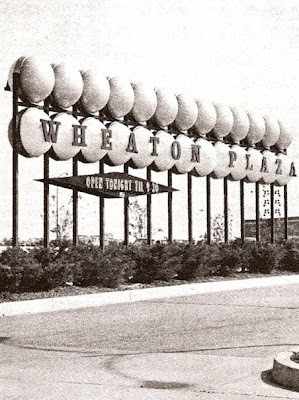 I was just in Wheaton yesterday, and I like your entrance to Wheaton Plaza a lot. But there's one other Wheaton landmark that has stood the test of time - the late Chuck Levin's Washington Music Center (though the buildings that make up his place are not that attractive, but so what?). You see city/town-themed shirts in CVSs and supermarkets throughout the country and most of the time it's just plain athletic-style logo. Something with some pizzazz and local color should do much better. Here in Takoma Park, we've got a funky shop or 2 that would probably carry TKP themes. 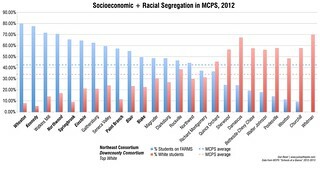 Silver Spring's could probably go in Fenton St. market. Don't know where these might go with Wheaton. I would definitely get a shirt like that. Let me know if you post it on a site like CafePress or Zazzle or the like. Don't forget to make a palette-swapped version for printing on dark clothes. That's a great idea! I know I'd definitely scoop up a few. I've always thought about why I never saw vendors selling stuff like that at the Fenton Street markets - they would clean house. My wife would buy six.